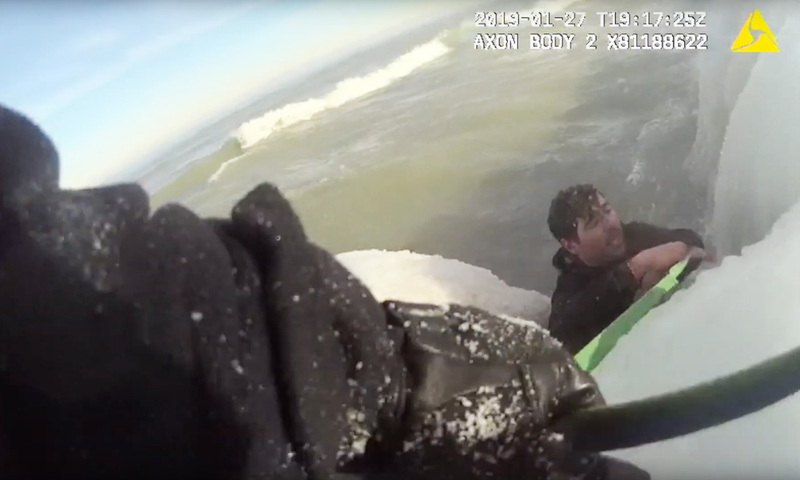 Dramatic body camera video released Monday shows Chicago officers pull a 33-year-old man from the icy waters of Lake Michigan after he jumped down a high ridge of ice to rescue his dog and became trapped Sunday afternoon. Officers from the 21st District responded to Foster Avenue Beach around 1 p.m. Sunday following reports of a person in the water. After borrowing a dog leash from a woman on the scene, they carefully made their way out onto the ice, mindful that they could fall in too. While the Chicago Fire Department usually handles water rescues, officers from the Lincoln District patrol about two miles of beachfront and average four water rescues a year. “I know that in cold water, the time that we got there, that this guy’s not gonna last a few more minutes,” CPD Sergeant Alex Silva said. As the video shows, officers threw the leash to the man to help him move to the edge of the ridge. After he struggled to pull himself up, Silva reached out and grabbed him by the hand. Silva said other officers grabbed onto his and each other’s belts, forming a human chain before helping the man pull himself up. “He was exhausted, and I remember shouting out to him, you’re going to have to pull yourself up, and he did,” CPD Officer Adam Ocampo said. After the ordeal the man was thankful to reunite with his dog inside a warm police car. He was taken to a nearby hospital in good condition. While the man asked to remain anonymous, he released a statement detailing the day’s events and thanking the officers who saved his life. He said it was his first visit to the park with his nine-month-old American Eskimo mix Pika, and after the dog got away from him, he ended up running to the edge of the ice ridge and falling into Lake Michigan. After jumping into the waist-deep water to grab the dog, he said he looked to find a way out — and was trapped. “Ice walls that rose two feet above my head stretched across the entire shore, trapping us in the water. I looked for a possible exit but could not find one,” he wrote. After realizing he couldn’t grip the sheer ice walls, the man writes he called 911 on his cell phone, but a bystander had already contacted nearby officers after seeing him jump into the water. Officer Silva now says he keeps a leash in his bag, in case the occasion ever rises again. The dog owner cautioned others to be careful with their pets near the shoreline at Foster Avenue and other beaches. “I’ve seen many ice formations in my nearly 7 years of visiting these beaches in the winter, but these ice walls are the tallest and most shear I’ve ever seen,” he wrote. This story had a happy ending, but police say if this happens to your pet, don’t try to be a hero, and instead call 911 for assistance.